This lucky girl and her Yeti received the ice cream attachment for their Kitchen Aid last year, yay wedding registry and yay awesome friends. This attachment also came with an ice cream recipe book by the name of Sweet Cream and Sugar Cones by the brilliant minds of Bi-Rite Creamery in San Francisco. I highly recommend this book, it is concise yet thorough, there are plenty of pictures and it not only includes their signature recipes, but also recipes for some non-ice cream treats. One of the greatest parts in this book is in the introduction titled, The Importance of Sharing. The section talks about how one of the best pastry chefs they ever knew gave away every recipe and that there’s something beautiful about sharing knowledge and encouraging others to learn and develop new skills (Sweet Cream and Sugar Cones, p.5). Book by Kris Hoogerhyde, Anne Walker, and Dabney Gough. It took me 3 attempts to get it semi right, but when I finally did it was a very heartfelt moment. Ice cream is one of my favorite foods and I can’t believe it took me so long to make it myself. I felt like I found the love of my life at 85 and so much time had passed. 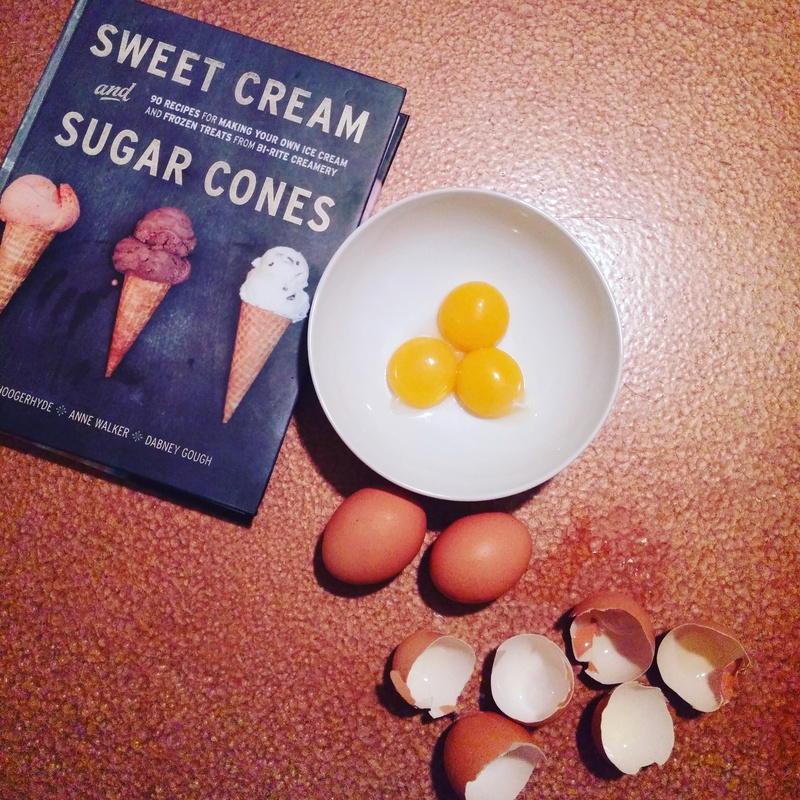 This book also showed me a great method of making caramel which I added to the second batch of this ice cream, but it is not necessary because bourbon peaches are awesome enough. I made this ice cream for a friend on his birthday. 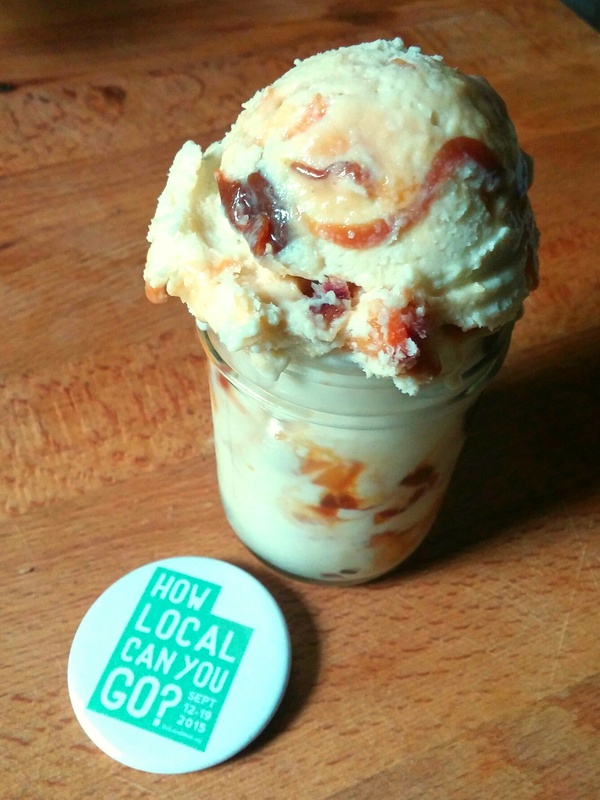 I like alliterations and his name is Benn which lead to Benn’s Birthday Buttermilk Brown Sugar Ice Cream with Bourbon Soaked Peaches, say that three times fast. I chose the Buttermilk ice cream recipe from the book and adapted it. You will need an ice cream machine. This is a great recipe to make ahead because the ice cream base chills for at least 2 hours or overnight and the finished product is firmer when chilled 4 hours. Toss chopped peaches in a small bowl with a tablespoon of sugar then add bourbon. Sugar draws out the moisture in the fruit and the bourbon helps them not freeze solid when in the ice cream. In a heat proof bowl, whisk the egg yolks with ½ cup of white sugar and set aside. In a saucepan stir together cream, milk, and brown sugar. The buttermilk is added later after the ice cream base has cooled in the fridge. DO NOT ADD BUTTERMILK TO THE HOT CREAM MIXTURE. Cook ice cream base over medium high heat and reduce to medium once the base has reached a simmer. Next, take ¼ small amount of the hot cream mixture and gradually whisk it into the bowl of egg yolks. Using a spatula, stir the base on the stove top while slowly adding the tempered yolks (whisked yolks which have hot cream introduced to them). Stir the base constantly until it has thickened. This should only take 1 or 2 minutes. You’ll know it’s ready when it holds a clear path after running your finger across the spatula. It’ll look like a slightly thin bisque. Strain the base through a mesh strainer into a clean container, then place that container into an ice bath to stop the cooking and help cool down the base before it goes into the fridge. Stir the base occasionally and when it’s cool to the touch, cover it and place it into the fridge for 2 hours and up to overnight. After the base has chilled for an appropriate amount of time ,whisk in the buttermilk and vanilla to the ice cream base. Pour the base into your ice cream machine and freeze in your ice cream machine, make sure to follow the manufacturer’s instructions. While this is happening put the container for storing the ice cream in the freezer so that it will keep everything from melting when you transfer it and add more ingredients. Also, drain the bourbon for your peaches and use it to make a delicious cocktail while you wait, two treats in one, BAM! After the ice cream reaches a soft serve consistency it is ready! Place it in a storage container and layer with peaches. 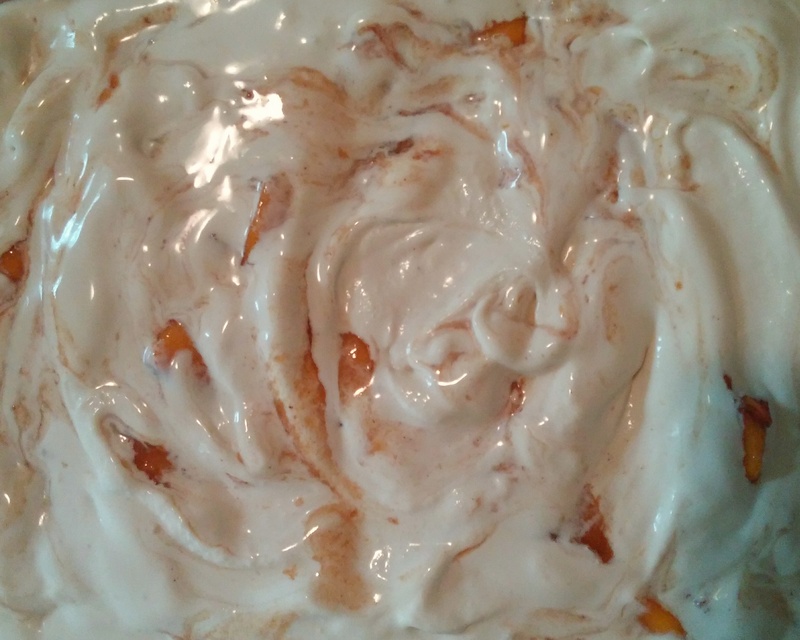 For my second batch of this ice cream I added caramel which you can make or buy. As far as instructions on how to make caramel click here, it is a whole other skill to tackle. Layer the base. sprinkle peaches between the layers. You can enjoy the ice cream right away, but I like to put it straight back in the freezer and let it get firm which takes a couple of hours. The first batch had to wait because I didn’t know that you have to freeze the ice cream attachment overnight. This may not be the case with other ice cream makers, so read those instructions! The second batch of ice cream I ever made was the consistency of cement. I cooked the ice cream base too long. Don’t do that. The third batch of ice cream I made spun forever in the ice cream attachment and never reached the right consistency. This happened because I didn’t let the ice cream base chill in the fridge long enough, because I was impatient. Two hours is the smallest amount of time the base should be in the fridge, but longer is better. Don’t worry, with this mistake you can just put the base back in the fridge, and in my case, refreeze the ice cream maker attachment and try again the next day. Tempered the yolks properly by whisking in a small amount of the warm cream base before adding the eggs to the mix so that they won’t scramble. Choosing fresh quality ingredients. The better the ingredients you use the better your ice cream will taste. I used Winder Farms Dairy, Muscovado cane sugar, farm fresh eggs, Brigham City peaches, and High West Whiskey. I took the bourbon that I soaked the peaches in and made a peach Old Fashioned. 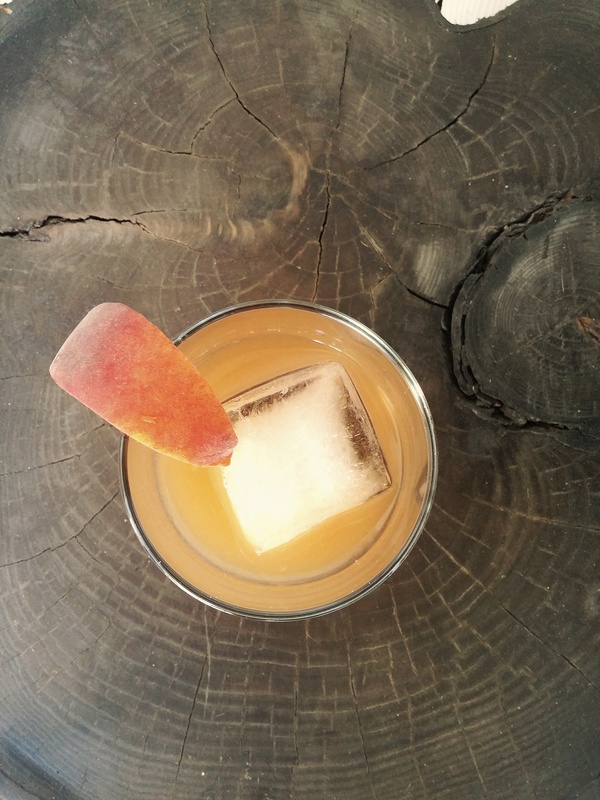 1 oz of bourbon, 1/2 ounce of bourbon that has been infused with sugar and peaches, a dash of bitters, ice and a good stir. Chill the ice cream base longer. I just can’t wait sometimes, but you should. Watch a movie, go grocery shopping or forget about the base until the next day. Make the peaches into a purée and/or soak them in bourbon longer. I used Winder farms dairy, local farm fresh eggs, High West Whiskey and Brigham City peaches.